Catechol-O-methyltransferase (COMT) is one of the most important enzymes involved in estrogen metabolism and its functional genetic polymorphisms may be associated with breast cancer (BC) risk. Many epidemiological studies have been conducted to explore the association between the COMT Val158Met polymorphism and breast cancer risk. However, the results remain inconclusive. In order to derive a more precise estimation of this relationship, a large meta-analysis was performed in this study. Systematic searches of the PubMed, Embase and Cochrane Library were performed. Crude odds ratios (ORs) with 95% confidence intervals (CIs) were calculated to estimate the strength of the association. A total of 56 studies including 34,358 breast cancer cases and 45,429 controls were included. Overall, no significant associations between the COMT Val158Met polymorphism and breast cancer risk were found for LL versus HH, HL versus HH, LL versus HL, recessive model LL versus HL+HH, and dominant model LL+HL versus HH. In subgroup analysis by ethnicity, source of controls, and menopausal status, there was still no significant association detected in any of the genetic models. Our meta-analysis results suggest that the COMT Val158Met polymorphism may not contribute to breast cancer susceptibility. Breast cancer is one of the most frequently occurring cancer and cancer-related deaths are highly prevalent worldwide, which has become a major public health challenge. The mechanism of developing breast cancer is still unclear. It has been widely accepted that exposure to circulating estrogen may be important in the development of breast cancer. Since estrogen biosynthesis and metabolism consist of many translation and transcription steps, the genes involved in these processes may contribute to the level of estrogen and thereby influence the susceptibility to breast cancer. Among the genes identified, BRCA1 and BRCA2 mutations have been reported to be associated with a dominantly inherited increased risk of the disease. However, they only account for about 5% of breast cancer occurrences. This fact leaves the possibility that low-penetrance genetic factors are likely to explain most of disease cases. Catechol-O-methyltransferase (COMT) is an important phase II enzyme involved in the conjugation and inactivation of catechol estrogens. COMT is expressed at high levels in a variety of human tissues including liver, kidney, breast, and red blood cells. The COMT gene is located on chromosome 22q11. A G to A transition in the COMT gene results in valine to methionine amino acid change in codon 108/158 in the cytosolic/membrane-bound form of the protein. This amino acid change is believed to result in a 3–4-fold decrease in enzymatic activity[6, 7]. Since the variant form (Met) has been associated with decreased activity of the COMT compared with the wildtype (Val), these two forms are represented as COMT-L allele and COMT-H allele, respectively. It has been hypothesized that the individuals who inherit the low activity COMT-L gene may be at increased risk for breast cancer because of an increased accumulation of the catechol estrogen intermediates[8–11]. The role of COMT Val158Met polymorphism in the development of breast cancer has been investigated in the past decade, with conflicting results. Several studies have previously suggested an association between the COMT Val158Met polymorphism and an increased risk of breast caner[12–14]. However, other studies have failed to confirm such an association[15, 16]. Moreover, two meta-analyses investigating the same hypothesis[17, 18], quite similar in methods and performed almost at the same time, yielded different conclusions. The exact relationship between genetic polymorphisms of COMT Val158Met and susceptibility to breast cancer has not been entirely established. To clarify the effect of COMT Val158Met on the risk of breast cancer, our study undertakes a meta-analysis of all published case–control observational studies. Electronic databases PubMed (http://www.ncbi.nlm.nih.gov/pubmed/), Embase (http://www.embase.com/) and Cochrane Library (http://www.thecochranelibrary.com/view/0/index.html) were used to search for all genetic association studies evaluating the COMT Val158Met polymorphism and breast cancer risk up to February 2012, the search strategy was based on combinations of “Breast cancer”, “Catechol-O-methyltransferase”, “COMT”, “polymorphism”, and “mutation”. No language or country restrictions were applied. All eligible studies were retrieved, and their bibliographies were checked for other relevant publications. Review articles and bibliographies of other relevant studies identified were searched by hand to find additional eligible studies. When multiple publications reported on the same or overlapping data, we chose the most recent or largest population. When a study reported the results on different subpopulations, we treated it as separate studies in the meta-analysis. Studies included in our meta-analysis had to meet the following inclusion criteria: (1) evaluate the association between COMT Val108/158Met polymorphism and breast cancer risk; (2) case–control design; (3) sufficient data for estimating an odds ratio (OR) with 95% confidence interval (CI); and (4) studies with full text articles. Studies were excluded if one of the following existed: (1) no control population; and (2) duplicate of previous publication. Information was carefully extracted from all eligible publications by two investigators (Xue Qin and Qiliu Peng) independently according to the inclusion criteria listed above. For conflicting evaluation, an agreement was reached following discussion during a consensus meeting with a third reviewer (Aiping Qin). For each study, the following information were collected: First author’s name, year of publication, country, ethnicity of the studied population, total numbers of cases and controls, breast cancer diagnosis criteria, matching criteria, genotyping method, menopausal status, sources of the control population, quality control of genotyping and P value for control population in Hardy–Weinberg equilibrium (HWE). We did not define any minimum number of patients to include in our meta-analysis. Crude odds ratios (ORs) together with their corresponding 95% CIs were used to assess the strength of association between the COMT Val158Met polymorphism and breast cancer risk. The pooled ORs were performed for co-dominant model (LL vs. HH, HL vs. HH, and LL vs. HL), dominant model (LL+ HL vs. HH), and recessive model (LL vs. HL+HH), respectively. Departure from the Hardy–Weinberg equilibrium for the control group in each study was assessed using a web-based program (http://ihg2.helmholtz-muenchen.de/cgibin/hw/hwa1.pl). In subgroup analysis, we evaluated the effect of COMT Val108/158Met polymorphism on the susceptibility of BC in different population stratified by ethnicity (Caucasian, Asian, and Mixed/other), menopausal status (Pre-, and Post-) and sources of the control population (HB, PB, and FB). For each genetic comparison, a chi-square-based Q-statistic test was used to evaluate the between-study heterogeneity of the studies. If P < 0.10, the between-study heterogeneity was considered to be significant, we chose the random-effects model to calculate the OR. Otherwise, when P ≥ 0.10, the between study heterogeneity was not significant, then the fixed effects model was used. We also measured the effect of heterogeneity using a quantitative measure, I 2 = 100% × (Q – df)/Q. The I statistic measures the degree of inconsistency in the studies by calculating what percentage of the total variation across studies is due to heterogeneity rather than by chance. Finally, the overall or pooled estimate of risk (OR) was calculated by a random effects model (DerSimonian–Laird) or a fixed effects model (Mantel–Haenszel) according to the presence (P < 0.10 or I 2 > 50%) or absence (P ≥ 0.10 and I 2 ≤ 50%) of heterogeneity, respectively. Cumulative meta-analysis was conducted to identify the influence of the first published study on the subsequent publications, and the evolution of the combined estimates over time according to the ascending date of publication. To identify potentially influential studies, sensitivity analysis was also performed by excluding the studies without definite diagnostic criteria, the studies without quality control when genotyping and the studies whose genotype frequencies in control populations exhibited significant deviation from the Hardy–Weinberg equilibrium (HWE), given that the deviation may denote bias. 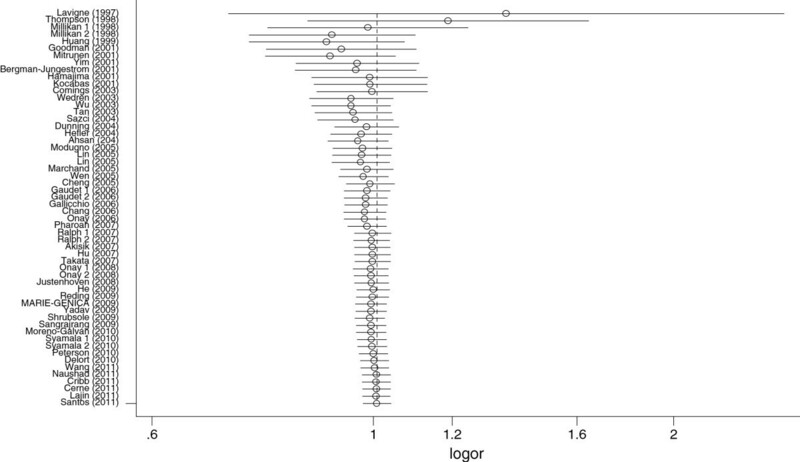 The funnel plots and Egger regression asymmetry test were used to assess publication bias. 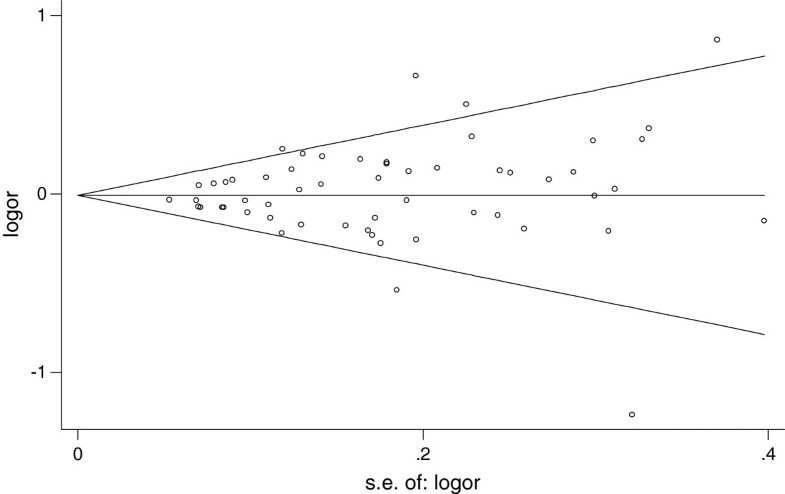 Egger’s test can detect funnel plot asymmetry by determining whether the intercept deviates significantly from zero in a regression of the standardized effect estimates against their precision. A T test was performed to determine the significance of the asymmetry. An asymmetric plot suggested possible publication bias (P ≥ 0.05 suggests no bias). All analyses were performed using Stata software, version 10.0 (Stata Corp., College Station, TX, USA). According to our search criteria, 61 studies relevant to the role of COMT Val158Met polymorphism on BC risk were identified. Ten of these articles were excluded: one of these articles was a review, four were overlapped subjects[22–25], four did not provide allele or genotyping data[26–29], and one was a study concerned with COMT 1222 G>A polymorphism. Manual search of references cited in the published studies did not reveal any additional articles. As a result, a total of 51 relevant studies met the inclusion criteria for the meta-analysis[9–16, 31–73]. Among them, five of the eligible studies contained data on two different ethnic groups, and we treated them independently[31, 51, 56, 60, 69]. Therefore, a total of 56 separate comparisons consisting of 34,358 BC patients and 45,429 controls were included in our meta-analysis. The characteristics of the 56 case–control comparisons selected for determining the relationship between COMT Val108/158Met polymorphism and risk of BC are summarized in Table 1. These 56 comparisons were consisted of 33 Caucasian samples, 18 Asian populations and 5 mixed/other populations. Thirty of the studies were population-based case–control studies and 20 were hospital-based studies, four of these studies[44, 54, 60, 69] presented COMT Val158Met polymorphism genotype distributions according to family history (familial-based breast cancer). There were 22 comparisons concerned with COMT Val158Met polymorphism and premenopausal BC patients and 27 comparisons concerned with COMT Val158Met polymorphism and postmenopausal BC patients (see Table 1). Seventy-one percent (40/56) studies in the present meta-analysis used the golden criteria of “histologically confirmed” or “pathologically conformed” as BC diagnosis. Eighty-two (46/56) percent of the control populations matched to BC patients with age and 52% (29/56) studies used the classic PCR-RFLP assay to genotype the COMT Val158Met polymorphism, about 52% (29/56) of the case–control studies included mentioned the quality control when genotyping. The genotype frequencies of control group in 3 studies were not consistent with HWE[33, 41, 70]. We could not calculate the P value of HWE in two studies[66, 73] because they only provided data with dominant model. To remove possible HWE stratification, for each analysis involving any of these 5 studies, sensitivity analysis would be carried out by excluding the studies the genotype frequencies for control group of which deviate from HWE and the studies whose P value of HWE in the control group could not be calculated. PB Population-based FB family-based, HB hospital-based, HWE Hardy–Weinberg equilibrium, NR not reported, Pre- premenopausal, Post- postmenopausal, PCR-RFLP PCR-based restriction fragment length polymorphism, MALDI-TOF MS matrix assisted laser desorption/ionization time-of-flight mass spectrometry, LP Luorescence polarization. a, b They were two different case–control studies in one publication. The pooled ORs along with their 95% CIs and the results of the heterogeneity test are presented in detail in Table 2. Overall, no significant associations between COMT Val158Met polymorphism and breast cancer susceptibility were observed in all genetic models when all the eligible studies were pooled into the meta-analysis. No significant associations were found for LL versus HH (OR = 0.999, 95% CI 0.0.925–1.078; I 2 = 55.0 and P = 0.000 for heterogeneity), HL versus HH (OR = 1.005, 95% CI 0.959–1.052; I 2 = 27.1 and P = 0.038 for heterogeneity), LL versus HL (OR = 0.983, 95% CI 0.926–1.045; I 2 = 44.4 and P = 0.000 for heterogeneity), recessive model LL versus HL+HH (OR = 0.988, 95% CI 0.929–1.050; I 2 = 51.3 and P = 0.000 for heterogeneity) and dominant model LL+HL versus HH (OR = 1.001, 95% CI 0.954–1.051; I 2 = 41.0 and P = 0.001 for heterogeneity). Next, the effect of COMT Val158Met polymorphism on breast cancer risk was evaluated according to ethnicity, menopausal status (Figure 1; Figure 2) and sources of controls. Similarly, no significant association was found in any of the genetic models. We further conducted a meta-analysis after the five studies[33, 41, 66, 70, 73] whose genotype frequencies significantly deviated from HWE or whose P values of HWE in the control population unable to be calculated were excluded. The results were not materially changed in any genetic models. Sensitivity analysis by excluding the studies without definite diagnostic criteria and the studies without quality control when genotyping did not alter the pattern of the results. Cumulative meta-analysis was performed for dominant model LL +LH versus HH in the overall populations. In the overall populations, the random effects odds ratio was always insignificantly larger or smaller than 1. It changed little from around 0.998 after the year 2007 (Figure 3), indicating the stability of the association. OR odds ratio, CI confidence intervals, R random effects model, F fixed effects model, PB Population-based study, HB Hospital-based study, FB Familial-based study, Pre- Premenopausal, Post- Postmenopausal. OR and 95% CI of individual studies and pooled data for the association between the COMT Val158Met polymorphism and BC in premenopausal populations using a random-effect model (dominant model LL+HL vs. HH). OR and 95% CI of individual studies and pooled data for the association between the COMT Val158Met polymorphism and BC in postmenopausal populations using a random-effect model (dominant model LL+HL vs. HH). Cumulative meta-analysis of the association between COMT Val158Met polymorphism and breast cancer susceptibility risk of the overall populations using a random effects model (dominant model LL+HL versus HH) . Each study was used as an information step. The vertical dotted line is the summary odds ratio. Bars, 95% confidence interval (CI). Begg’s funnel plots and Egger’s tests were performed to assess publication bias. The shapes of the funnel plots revealed no obvious asymmetry (Figure 4). The Egger’s test was then used to statistically assess funnel plot symmetry. The results suggested no evidence of publication bias (t = 0.94 and P = 0.352 for dominant model). The results indicated that the results of these meta-analyses are relatively stable and that publication bias is unlikely to affect the results of the meta-analyses. Funnel plots for publication bias in the studies of the meta-analysis on the association between COMT Val158Met polymorphism and breast cancer risk of the overall populations (dominant LL+HL versus HH). Estrogens, estrone, and estradiol are catabolized to catechol estrogens. Estrogen metabolites, such as 4-hydroxyestrone and 4-hydroxyestrone, shown to be involved in breast carcinogenesis. Catechol-O-methyltransferase (COMT) catalyzes the O-methylation of these carcinogenic estrogens to methoxyes tradiols and methoxyestrones. In the COMT gene, a G to A transition results in an amino acid change (Val/Met) at codon 108 of soluble COMT and codon 158 of membrane-bound COMT. This amino acid change is believed to result in a 3–4-fold decrease in enzymatic activity[6, 7]. It has been hypothesized that individuals who inherit the low activity COMT gene may be at increased risk for breast cancer because of an increased accumulation of the catechol estrogen intermediates. The potential association between the COMT Val108/158Met polymorphism and the risk of subsequent BC has evoked a huge interest from clinicians, scientists, and the public. During the past few years a large number of studies with case–control design have been carried out to investigate this topic but consistent results have not been reported. We therefore conducted a meta-analysis of the evidence obtained from all published studies in order to elucidate and provide a quantitative reassessment of the association. To our knowledge, this is the most comprehensive meta-analysis to date to evaluate the association between COMT Val108/158Met polymorphism and breast cancer risk. We did not observe a positive relationship between COMT Val108/158Met polymorphism and breast cancer risk either overall or among subgroups of women defined by ethnicity, menopausal status or sources of the control population. In previous studies, overall the findings were inconsistent. Lavigne et al. observed a large increase in the risk of breast cancer among postmenopausal obese women carrying the COMT-LL genotype, and an inverse association among premenopausal women with the relative risk (RR) for COMT-LL stronger among postmenopausal women with high BMI. Thompson et al. reported positive associations for the COMT-HL and COMT-LL genotypes among premenopausal women and found that modification of RRs by BMI was highest among premenopausal women with a high BMI. A comprehensive study of the entire estrogen-metabolizing pathway (CYP17, CYP1A1, COMT) also reported that breast cancer is only associated with the low activity COMT genotype in women with a high BMI and that the COMT-LL genotype was strongly associated with breast cancer risk, with an adjusted OR of as high as 4.02. In contrast to the other studies but in line with the findings of the current study, Lajin et al. did not observe any association between one or two copies of the COMT-L allele and breast cancer risk, and did not find strong modification of RR estimates by menopausal status. In an effort to shed some light on the impact of COMT Val108/158Met polymorphism on breast cancer risk, two previous meta-analyses[17, 18] were conducted almost at the same time to explore the relationship between COMT Val108/158Met polymorphism and breast cancer. Ding et al. examined the effect of COMT Val158Met polymorphism on breast cancer risk by combining results in meta-analysis. They concluded that COMT Val158Met polymorphism was significantly associated with increased breast cancer risk in European population. However, Mao et al. did not find any relationship between COMT Val158Met polymorphism and breast cancer risk in any genetic models including among Caucasian, Asian, premenopausal, and postmenopausal women in their meta-analysis, which was consistent with the findings of our study. The discrepancy in previously reported findings was most probably because that the previous studies with relatively small sample size may have insufficient statistical power to detect the exact effect or may have generated a fluctuated risk estimate. However, in our study, large number of cases and controls were pooled from all published studies, which greatly increased statistical power of the analysis and provided enough evidence for us to draw a safe and reliable conclusion. Heterogeneity is a potential problem that may affect the interpretation of the results. 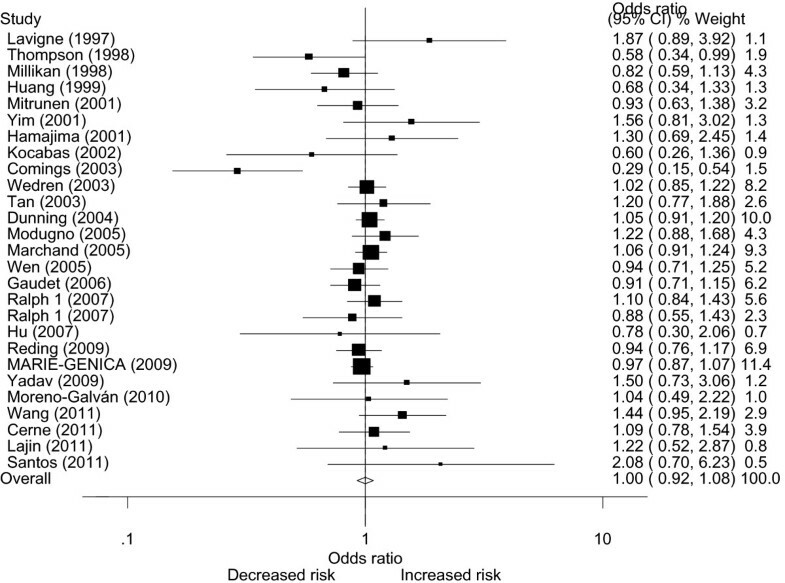 The present meta-analysis showed that there was large heterogeneity between studies (table 2). Common reasons for heterogeneity may include differences in the studied populations (e.g., ethnicity, menopausal status), or in methods (e.g., genotyping), or in sample selection (e.g., source of control populations), or it may be due to interaction with other risk factors (e.g., BRCA variants). Finding of the source of heterogeneity is one of the most important goals of a meta-analysis. Therefore, we stratified the studies according to ethnicity, source of control subjects of the studies, and menopausal status. Subsequent subgroup analysis stratified by ethnicity, source of control subjects, and menopausal status identified large heterogeneity as well, indicating that menopausal status, ethnicity or source of control subjects contributed little to the existence of overall heterogeneity. Unfortunately, our study had insufficient information for subgroup analysis to detect whether the variants in BRCA gene might be great sources of heterogeneity. We found that in three studies[33, 41, 70] the genotypic frequencies showed significant deviation from the expected frequencies based on Hardy–Weinberg equilibrium and two studies[66, 73] provide insufficient data for calculating P value of HWE in the control populations. Excluding these five studies did not alter the heterogeneity between studies. However, when heterogeneity between the studies exists, the results could be interpreted in the context of cumulative meta-analysis, which provides a measure of how much the genetic effect changes as more data accumulate over time. 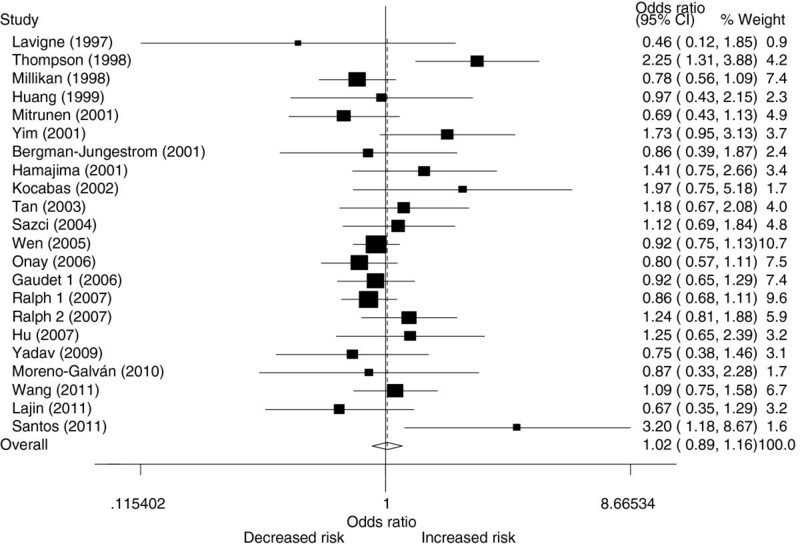 In our study, the results of cumulative meta-analysis for dominant model LL+HL versus HH showed stability in pooled odds ratio after the year 2007 in the overall populations, which provide evidence for drawing safe conclusion about the insignificant association between COMT Val158Met polymorphism and breast cancer risk. Some limitations of this meta-analysis should be acknowledged. First, some studies found significant associations between COMT Val108/158Met polymorphism and breast cancer risk in several subgroups of populations, such as associations among postmenopausal women with a low body mass index (BMI)[10, 11], a high BMI or women at young ages. It is difficult for a meta-anlysis to derive such specific associations because the results from previous studies were not presented in a uniform standard. Second, our results were based on unadjusted estimates and a more precise analysis should be carried out if individual data were available, this would allow for adjustment by other covariates including age, BMI, ethnicity, lifestyle, and environmental factors. Third, all of the studies were performed in Asian and Caucasian populations. Further studies are needed in other ethnic populations because of possible ethnic differences of the COMT polymorphisms. In spite of these, our present meta-analysis also had some advantages. First, substantial number of cases and controls were pooled from all publications concerned with COMT Val158Met polymorphism and BC risk, which greatly increased statistical power of the analysis and provided enough evidence for us to draw a safe conclusion. Second, the quality of case–control studies included in this meta-analysis was satisfactory according to our selection criteria. Third, no publication bias was detected in this meta-analysis, which indicated that the pooled results of our study should be reliable. In conclusion, this meta-analysis suggests that the COMT Val158Met polymorphism may not be associated with breast cancer risk. However, it is necessary to conduct large sample studies using standardized unbiased genotyping methods, homogeneous breast cancer patients, and well-matched controls. Moreover, gene-gene and gene-environment interactions should also be considered in the analysis. Such studies taking these factors into account may eventually lead to a better, more comprehensive understanding of the association between COMT Val158Met polymorphism and BC risk. Xue Qin, Qiliu Peng, Aiping Qin, Zhiping Chen contributed equally to this work. The authors declared that they have no conflict of interest in relation to this study. All authors have read and approved the final files for this manuscript.